Thanksgiving is less than 2 weeks away! November is just flying. I’ve got several more recipes I think should grace your table for the holiday weekend. 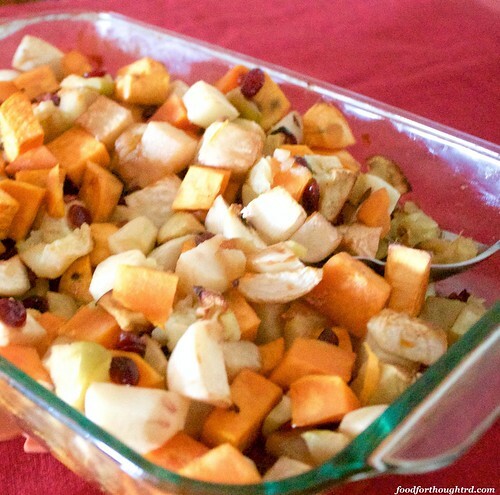 This vegetable bake is definitely different from your standard Thanksgiving starch. It definitely wouldn’t replace potatoes on your table, if that is what you are looking for. But it deserves some attention and consideration. A great balance of sweet, tangy, and savory is achieved with all of the different flavors. It even tastes great doused in gravy! 1. Preheat oven to 350. Lightly coat a 9×13 baking dish with cooking spray. 2. Combine all the ingredients, tossing to coat all the produce. Spread evenly in baking dish. 3. Bake for 1 ½ hours, stirring after 45 minutes, or until desired tenderness. Recipe Notes: I actually didn’t LOVE this dish the first time I made it. I liked it better as leftovers, especially if eaten with some gravy. It sounds odd putting gravy on this mix, but it worked. Promise! Low Iodine: shouldn’t need any adjustment, if you are allowed brown sugar. I found mixed answers on this. You could try subbing honey instead.